Reopen­ing of Nato supply will be a step agains­t Pakist­an, says JI chief. MULTAN: Even if the government decides to restore Nato’s supply route, the country’s religious parties plan to robustly oppose the move. At the Difa-e-Pakistan conference here on Sunday, the leaders threatened a siege of parliament if the Nato supply line was restored. Jamaat-e-Islami chief Munawwar Hassan said on Sunday that any resolution submitted in parliament favouring restoration of the US-Nato supply routes would be a step against Pakistan. The speakers declared that parliamentarians approving the resolution for allowing Nato supply resumption and those who granted the most favoured nation (MFN) status to India must be ready to “face the music”. Chief of Ahle Sunnat wal Jamaat (ASWJ) Ahmed Ludhianvi said that if the government decides to restore Nato supply routes, his party workers would block the route themselves. The supply route was suspended by Pakistan after the November 26, 2011 Nato air strikes that killed 24 Pakistani soldiers and took Pakistan’s fragile alliance with the US to new lows. Jamiat Ulema-e-Islam-Sami chief Maulana Samiul Haq also addressed the convention and said that “if the US, Israel, India or Nato forces” attack Pakistan’s border, they will retaliate against them with “full force”. Malik Ishaq, the former head of the Lashkar-e-Jhangvi, also attended the gathering on the special invitation from the ASWJ leadership. “We will not let this government negotiate with India and the US who are the greatest enemies of Pakistan,” said Difa-e-Pakistan Council Chairman Maulana Samiul Haq. “The government will see its worst days if they restore the Nato supply line. We will surround the parliament and will not allow them to move outside unless they change their decision,” he added. 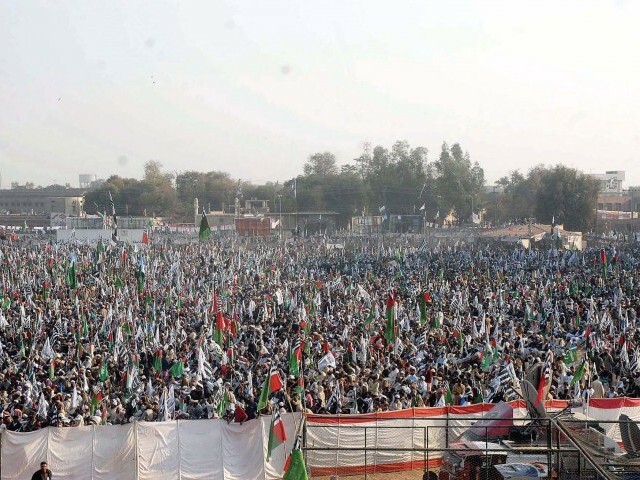 The ASWJ had expected an attendance of more than 200,000 people for the gathering but intelligence sources estimated that about 50,000 participants came to the venue. The meeting was attended by the Sheikh Rasheed, Hafiz Saeed, Hameed Gul, and leaders of many religious parties from across the country including Ijazul Haq, Abdul Rehman Maki, Hafiz Saifullah Mansoor and Maulana Ameer Hamza. Meanwhile, the Markazi Jamiyat-e-Ahl-e-Hadees (JAH) demanded an inquiry into the funding of the event. The group’s local chief Allama Khalid Mehmood Nadeem said the government should take notice of the “millions of rupees” wasted in organising the Difa-e-Pakistan convention. Published in The Express Tribune, January 30th, 2012. If government restores NATO supply route, it will be a step against Pakistan, says JI Chief. At least 21 people killed for political or sectarian reasons this January. Imran Khan, Jamaat-e-Islami chief Munawar Hassan, Awami League chief Sheikh Rasheed to attend rally, say JuD. Their agenda is mainly threats, strikes,warnings, lecture about morality and that America & India is behind all that is wrong with Pakistan. What about social reforms, economic,education,health policises, how will they improve the quality of life of a common man……looking at them I dont think they have a clue. Being a muslim we beleive that Allah (SWT) the Creater of human being Knows us Best, Allah SWT through His Messenger has explained the social reforms,economics, education, health policies we need and how to improve quality of life and alleviate poverty, in Quran and Sunnah. Afsoos sad afsoos, we are wandering still in search of Hidayat from Enemies of Allah and His Rasool and in books of non believers western author and media. Allah Subhana’hoo wa’ta’ala may forgive us. Even in oil rich countries( people are still poor- nigeria/yemen/oman/saudi/iraq/iran). Allah cant be the reason for not putting in hard work. Honestly, I now feel like only India and USA are interested in a stable Pakistan. Strange as that may sound! Your judegement is material based. Its true handful oil rich muslim states are rich only while other poor. right but why? because no state whether rich or poor follow the true islamic teaching and guidance. If muslim states only follow the islamic principle of Zakat and simplicity there would not be any poor atleast in islamic world. In fact no muslim country in the whole world is a true Islamic state. Only the poor Taliban during their short rule in Afghanistan implemented the System of Allah but they were overturned. Success for humanity lies in implementing and practicing Islamic principles, just pronouncing or declare someone a muslim, has no result. No country is ever a true islamic state, because such a state is impractical and unreal. Islamic vision is more fiction than reality. That is what history teaches us. I think it is quite legitimate on the part of the Islamist groups to protest reopening of NATO supply route for the latter has been instrumental in violating the sovereignty of Pakistan on many occasions and on various pretexts. But their sweeping generalization of the USA and India as their enemies is misplaced. I can understand why they are so implacable haters of anything Indian or American but they must also remember that these countries always favour a stable Pakistan. The USA is the largest aid provider to them and India too is willing to extend its cooperation in different fields provided they shed their preoccupation about them and adopt a more balanced approach keeping in mind the well-being of their own nation. Mere holding the government to ransom does not help nor does religious fanaticism.